Contrary to common belief, lip balm is not the best way to combat dry chapped lips. Exfoliation is the 1st (and critical) step in fighting chapped lips! Exfoliating your lips twice a week will help rid of dead skin cells leaving lips soft and smooth, which allows moisture (aka lip balms) to penetrate your lips! In other words, exfoliation not only help soften your lips, it also helps your lip balm to work better! So, if you’re experiencing dry, flaky, and chapped lips this winter… use this super easy recipe of homemade lip scrub to make your very own Sugar Honey Lip Scrub. Your lips (and kissing partner) will thank you! Best part is that you probably have all the ingredients at home already, so get started now! 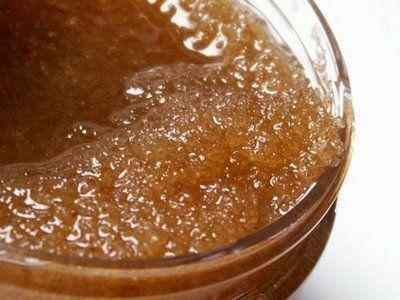 How To Make Homemade Lip Scrub? Add 1 teaspoon of Vaseline or softened shea butter and mix well. 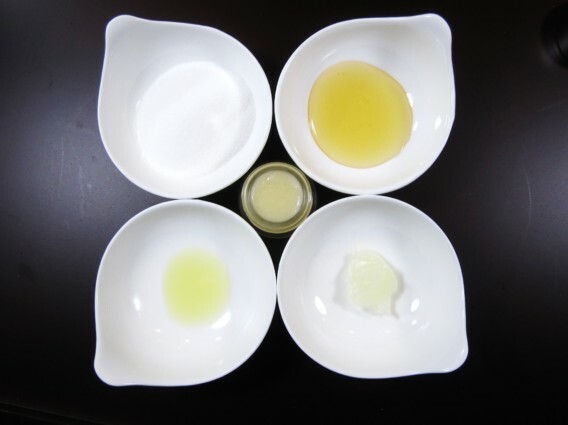 * If shea butter is not soft, soften by warming or use a spoon to whip/beat the shea butter before adding to the homemade lip scrub mixture. 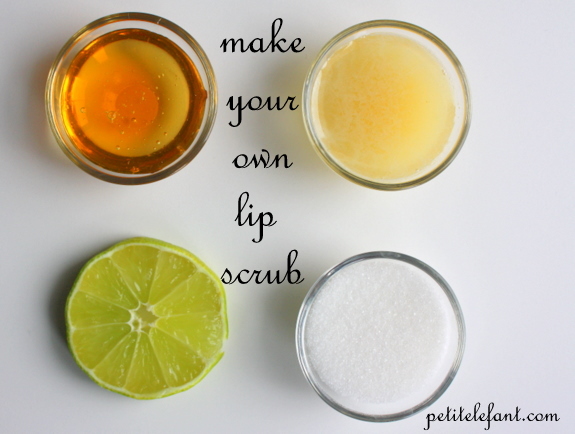 Take a dime size amount of homemade lip scrub and rub gently onto dry lips. Now that you have soft exfoliated lips, moisturize them with your very own homemade lip balm!~ Click here for the easy step by step tutorial! Until next time, stay pretty… inside and out! It’s date night. Kiddies are home with the sitter and you are all dressed up with your man at dinner. He leans in for a smooch on the lips, then quickly jerks away with surprise and horror in his face. The offender? Your sandpaper-crackly lips. Nothing says “Kiss me” more than dry crackling lizard lips! I don’t know about you, but during this time of the year my lips have the most difficult time staying soft. Once I gave my little boy a kiss on the cheek in the dark and he immediately mistook my rough lips for my husband’s rough facial scruff. He had to feel my face to believe it was really me. No joke. But it got even worse! When I came home from a tropical vacation to the dry and must I add FREEEZING dessert- my lips were having a major CRISIS! Don’t hide your eyes with what I am about to reveal to you… this is real. 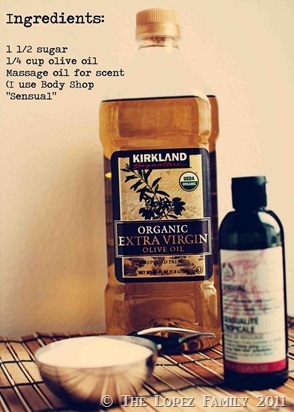 So here is an at home remedy to exfoliate and condition your smackers with ingredients you have around the house. Grab some coconut oil, brown sugar, and honey. Combine 1 tsp. of each. I added a little almond extract just because the smell makes me happy. Mix them until you get a paste-like substance. Note: I found these little bead containers work perfect for keeping my edible sugar lip scrub in the fridge. To exfoliate, simply apply the edible sugar lip scrub and rub into your lips for at least 30 seconds… no need to wipe off with a wet cloth- just lick it! Remember, to give your lips plenty of moisture after exfoliating. See the next recipe below. I continued to scrub every other day and applied a little treatment constantly on my lips to lock in the moisture and help my lips heal. And what did I use? Coconut Oil of course! We all know how fabulous it is (why? check this post out here) so, I combined some of that and vitamin E oil and applied directly after the scrub. 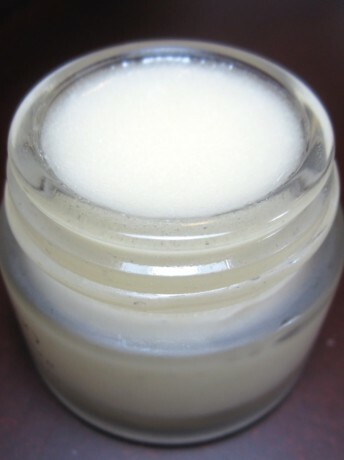 Realizing that the oil wasn’t staying on my lips for very long, I added some beeswax to the recipe to create a balm. I have to confess that I didn’t have beeswax on hand at the time so, I used some of my Burt’s Bees Chap Stick in the meantime. Worked like a charm! So to combine them, heat up the coconut oil and beeswax and combine that with a dash of vitamin E oil and you have just created a balm for your lips! Note: If you want your lip balm to set up more, add more beeswax and less oil. Just putting it in the fridge doesn’t work. I tried that and it still stays pretty oily. Now the fun part. I was curious about adding color. So, I grabbed some fruit. And it turns out that they add pretty colors to your balm! After washing them, heat each one in a small bowl in the microwave for like 5 to 10- seconds. It doesn’t take much for them to soften up. I found that the blackberries, pomegranate, and raspberries did better if I mashed it in a strainer and let the juice drip out. I added it to the oil and beeswax mixtures and let them set. Although I love to pamper my lips, I’m not a big fan of commercially-made lip scrubs–not only do many of them not work as well, they’re full of weird ingredients I don’t want on my lips. Instead, opting for a homemade, DIY organic lip scrub works best for me: Not only is it effective, it’s also really cheap and organic! 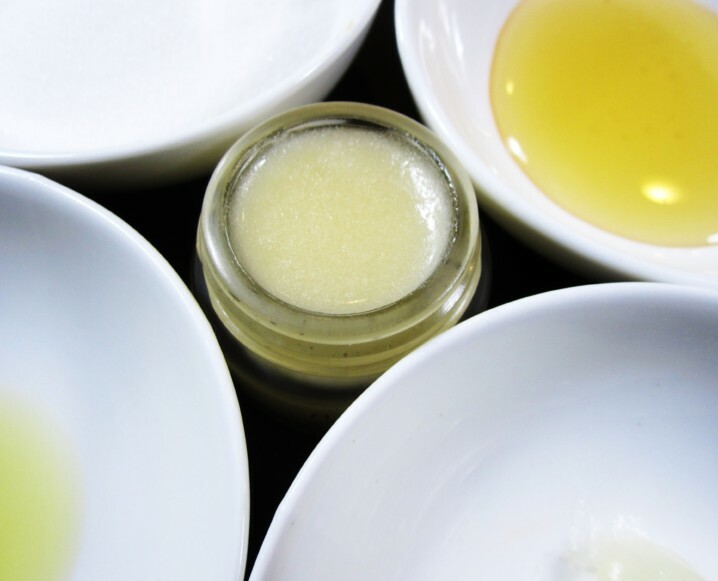 To make this organic lip scrub, you’ll need just three ingredients: olive oil, honey and sugar. For this recipe, they’ll need to be organic, but you can easily find organic types of these ingredients at Trader Joe’s or Whole Foods. 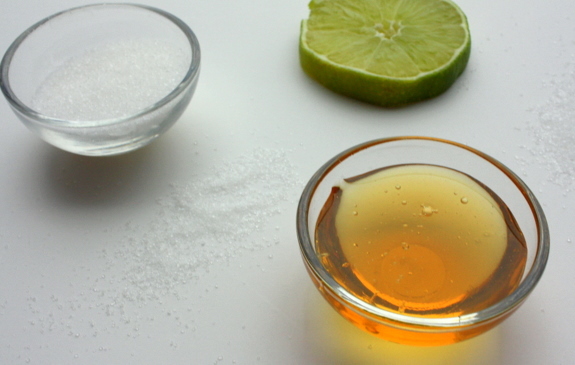 Optionally, you can replace sugar with brown sugar for softer, more gentle exfoliation. Why these ingredients? Sugar is an excellent exfoliator, or so says Sugar Laws.com, and honey and olive oil help nourish and soften the lips. Together, these ingredients make the perfect combo for turning your lips from dry to moisturized. To start, we’ll need to combine all of the ingredients in a small bowl. 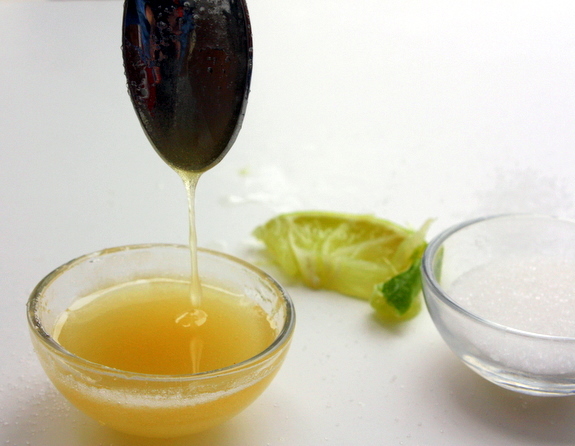 Add equal amounts of olive oil, honey and sugar into the bowl then mix well. If the consistency isn’t thick enough for you, add little amounts of sugar until it is thick enough. You can use anything to mix the concoction, but I prefer a tiny spoon–this makes it easier to scoop out later. Set the scrub aside for 10 minutes. After the 10 minutes has elapsed, it’s time for the fun part: exfoliating your lips. Using your clean finger or a toothbrush, dip it in the concoction until you have a thin amount. You don’t want too much of this–a little goes a long way. Going in circular motions, gently massage the mixture onto your lips. It should feel slightly scratchy at first, then melt into a nice, sweet glaze–your lips help melt it, which also turns it into an edible moisturizer. Continue massaging it into your lips for two to three minutes, or until the mixture completely dissolves. You can leave it on as is or gently wipe it away and apply a nourishing lip balm for additional moisturization. I generally make enough to fill half of the bowl, so I still have a lot of product left–but don’t throw it out! Instead, take any jar or Tupperware container and store it in your refrigerator. The product will harden slightly, but all you have to do is leave it out in room temperature for 10 minutes before it softens again. Lastability: Stored properly, this organic lip scrub should last for around two weeks. Good luck and happy exfoliating! But wouldn’t it be convenient to have a more travel-friendly homemade lip scrub? Something with a good, creamy texture that wasn’t going to melt everywhere? I’m a big believer in lip exfoliation. It takes you from whoa to WHOA in approximately 2.2 seconds. There aren’t many things in life that can blow your hair back in quite the same way. Especially when you can make your own lip scrub at home, in the comfort of your own kitchen with just a handful of natural, organic, delicious ingredients. We’re talking about some seriously tasty beauty business.Would you like the recipe so you can make some of your very own lip scrub at home? I thought you might. 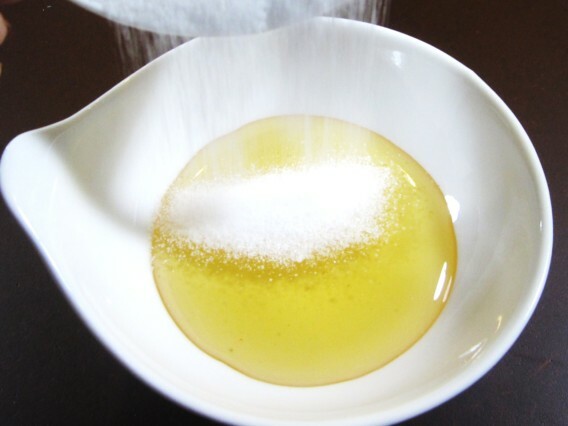 Using a tiny little dish from your kitchen mix the sugar and honey together until combined. 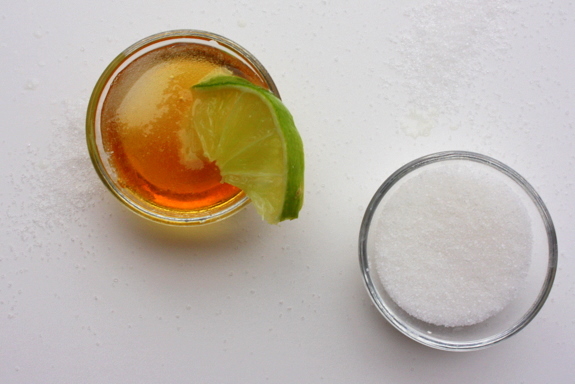 Add lime juice and mix until it the lip scrub has reached a semi-runny consistency. Use a spoon, a small paintbrush, or your fingers to cover your lips in the scrub; gently rub it all over. Repeat as needed until lips are completely smooth and buttery. 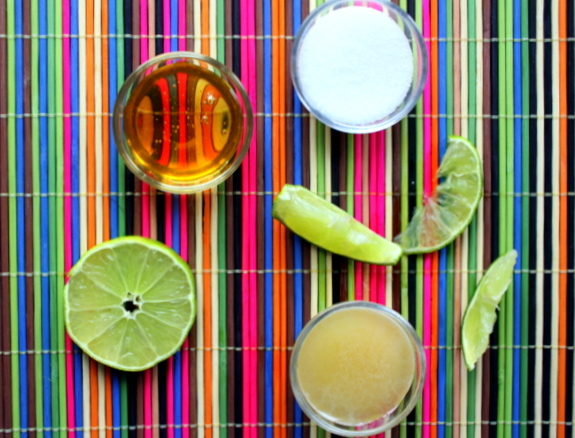 The sugar acts as the exfoliate, the lime rejuvenates the skin, and the honey is a natural anti-bacterial and cleanser. Boom. – p.s. I would never in a million and a half years wear red lipstick without doing this first. Never. Just wanted to put that out there in case you were thinking of wearing red lipstick tomorrow with chapped lips. We often tend to ignore our lips but it is true that lips need exfoliation just like our skin. Exfoliation is important to remove dead skin that can make your lips dry and flaky as our lips do not have oil producing glands. There are many lip scrubs available in the market but you can make your own lip scrubs at home using all natural ingredients which are definitely chemical free. Make the lip color last longer. 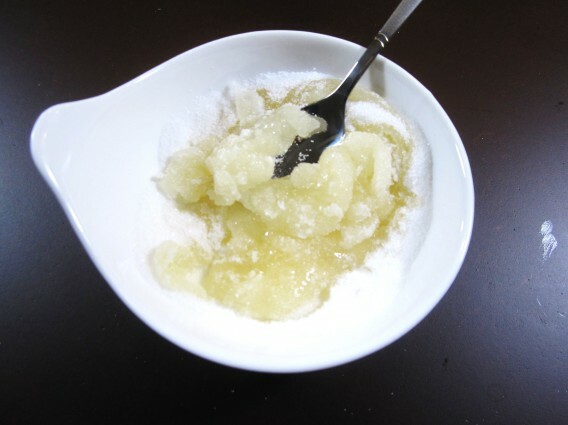 Sugar is often used in body scrubs and we are going to use it in this lip scrub as well. You can make a salt scrub but it wont taste good on your lips. Honey will give a sweet scent and make the scrub yummy. What are some good lip scrubs for chapped lips? Mix all of the ingredients in a small bowl until it reaches a thick consistency. Now you can apply the mixture on your lips. Gently rub the scrub with your finger on your lips. Rinse with warm water and immediately apply a lip balm to lock moisture. Mix both the ingredients well and apply on your lips. Gently rub and leave it on for 5 minutes. Rinse with water and apply coconut oil or olive oil to make your lips soft. Another great tip is to use toothbrush for removing dry skin from your lips. You can use toothbrush for applying scrub. Gently rub toothbrush on your lips for a minute and rinse.You can use these lip scrubs twice a week because excessive exfoliation removes moisture and results in painful chapped lips. DURING THE COLD WINTER MONTHS, my lips are always dry and chapped. No amount of lip balm could provide relief. Then I recently started to exfoliate my lips twice a week and what a difference it’s made! My exfoliated lips are able to absorb the moisture from the lip balm so much better than before. No more dead skin cells to get between my lips and they have their much needed moisture! The best part is that I was able to make an effective lip scrub using ingredients already in my kitchen. If you’re experiencing dry, chapped lips, try this super easy recipe to make your very own Sugar Honey Lip Scrub. Your lips (and kissing partner) will thank you! Each batch should be good for 1 week. Take a dime size amount of sugar honey lip scrub and rub gently onto dry lips. Apply lip balm as necessary. Use twice a week and your lips should be silky soft. 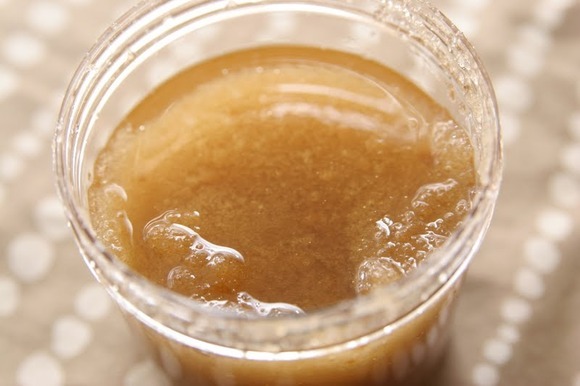 Mix the brown sugar and honey together to create a paste and thickly coat your lips. Leave it on for a few minutes then start gently scrubbing with your finger until all the dead skin has been buffed off. Immediately dab on olive oil or lip balm to moisturize. Now your red lipstick will glide on as it should! Repeat daily until you feel your old pout is back. I love using body scrubs, and I really want to try a lip scrubs. The only problem is that I’m really tired of paying for them! Body scrubs can get pretty expensive, especially when you want the really good stuff that smells great too. So, I searched around for some recipes to make homemade scrubs, and I thought I’d share. 1. 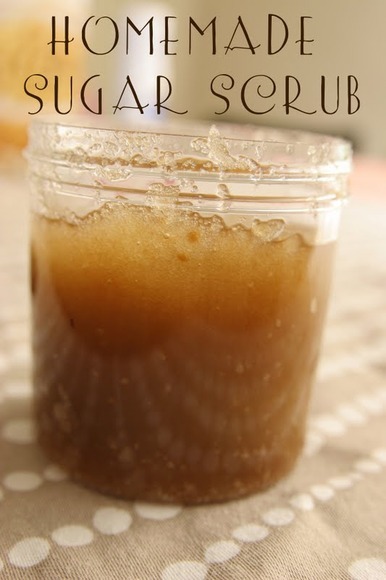 Homemade Sugar Scrub To make this scrub, use equal amounts of brown sugar and white sugar. (For a 6 oz. jar that equals about 1/4 cup of each.) Then, fill the jar to the top with olive oil. It should cover the sugars and then add an extra half inch of oil. Finally, just add about 1-2 tablespoons of vanilla extract and stir. 2. 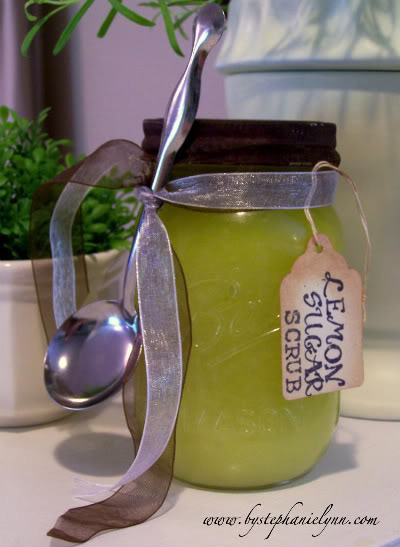 Lemon Sugar Hand Scrub To make this hand scrub, start by mixing 2 1/2 cups of sugar with 1 cup of extra virgin olive oil. Add 4 tablespoons of lemon juice (or scented essential oils). Mix until it is gritty. This is enough to fill a 12 oz. jar. 3. Homemade Salt Scrub For this scrub, you need to mix 1 1/2 cups of sea salt with 6 tablespoons of extra virgin olive oil together. Then cut 3 large lemons in half and squeeze the juice all over the salt mixture. Stir it until it’s well blended. This makes 6 mini salt scrubs. You can store them in the refrigerator for up to a week. 4. 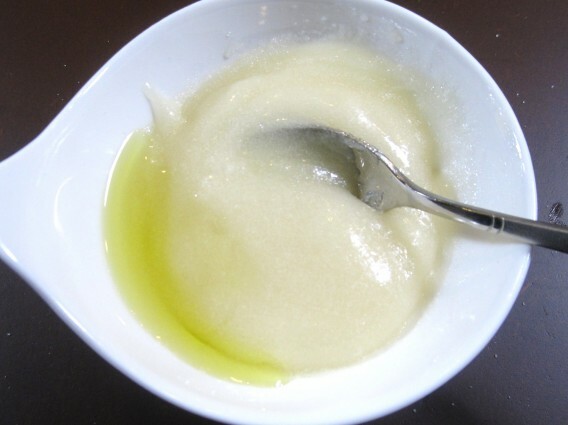 Homemade Sensual Sugar Scrub To make this scrub, mix together 1 1/2 cups of sugar, 1/4 cup of olive oil, and add a little bit of massage oil for a sensual scent. 5. 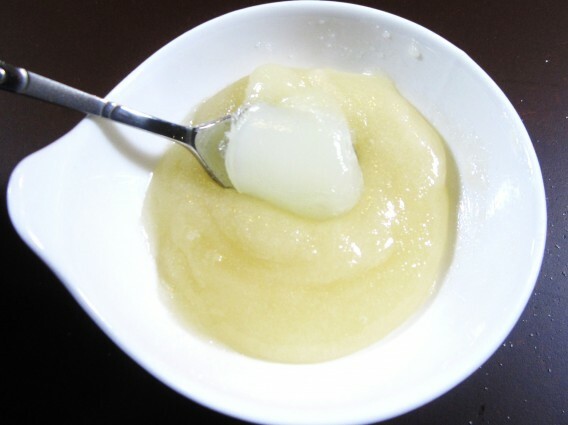 Yummy Lip Scrub To make this lip scrubs, pour 1 teaspoon of sugar into a small container. Add 2 tablespoons of honey (or olive oil). Then add a squirt of Vaseline and mix them all together. Using your finger, rub it on your lips and let it exfoliate. Then wipe this lip scrubs off and you’ll have softer lips. 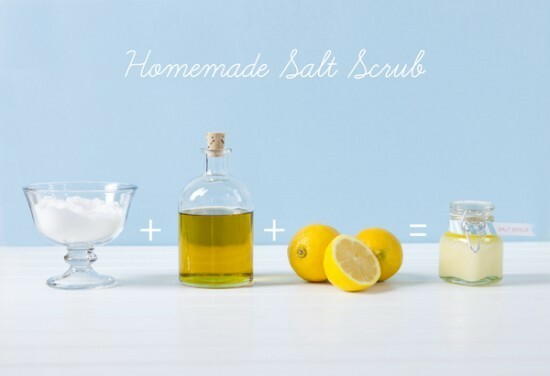 And now you can make homemade scrubs. Be prepared to have super soft hands and lips, and a smooth body. I can’t wait to try out some of these scrubs!